Woohoo! Another Turbo Trainer. From Wahoo. 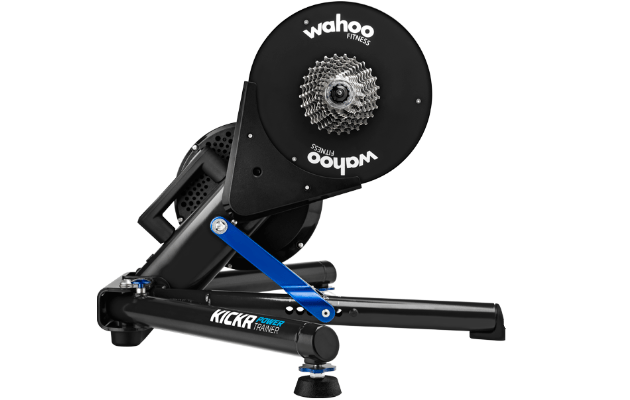 Just arriving on the indoor trainer scene is the Wahoo KICKR. You may have come across Wahoo as a supplier of training apps for your i-phone, as well as a producer of Bluetooth and Ant+ sensors, and the new RFLKT bike computer. 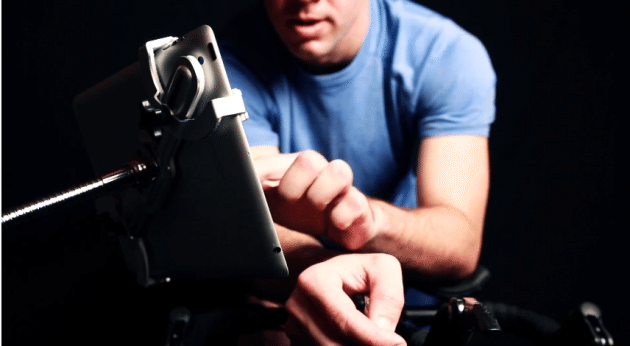 The Wahoo KICKR, which has just shipped in the US, has a number of novel technologies. First off is the trainer itself which you may recognise with the no rear wheel mounting system from the LeMond Revolution trainer. Getting rid of the rear wheel means that the KICKR will take any wheel size from 24” upwards; great for multi-genre cyclists and for parents whose kids also want to ride indoors. 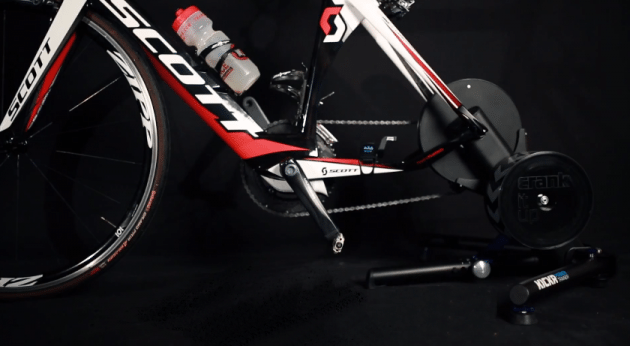 Although the mounting system is the same, where the LeMond uses a fan to create resistance, the KICKR uses a large, belt-driven metal flywheel and an electromagnet to provide resistance. The flywheel is also a lot quieter than a fan which is handy for those of us who don’t have a soundproofed training bunker. The real innovation though is that the Wahoo KICKR has no head unit. You view and control it via your iphone or your laptop. With the exception of power, all connections are wireless. Power measurements are taken from built in strain gauges, which have a claimed +/-2% accuracy. The KICKR can transmit and receive both Ant+ and Bluetooth signals, and although Wahoo have their own software, you are not limited to using it. Instead the trainer will connect to any Ant+ device or software. So you can run something like Strava or Endomondo on your phone, or connect to your Garmin; the choice is yours. First one is for use when Resistance levels are needed. They’ve built 10 levels into the unit, each with a progressive resistance curve so the faster you pedal the harder it gets, simulating both rolling and air resistance. Second is Erg mode. Set a target wattage and the KICKR will remain at that power output as you ride, independent of speed and cadence. Next we have Sim mode. Here you enter your weight, bike type, riding position, headwind and gradient and the KICKR will accurately model the power curve just as if you were riding outdoors. Finally there is a full Manual mode which allows you to adjust the resistance of the brake manually from 0 to 100%. But as mentioned, if you don’t want to use Wahoo’s software you don’t have to. Currently you can use Trainer Road or Kinomap, with more software options coming soon. Both Kinomap and Trainer Road are online based training systems and can provide structured programmes, virtual courses and even stages of the Tour to ride. This is one of the bonuses of the Wahoo KICKR; you’re no longer tied to a piece of software that you don’t like. Maybe it’s just not detailed enough or even too detailed, or it’s just the wrong colour. The KICKR allows you to switch when something new and better is released onto the market. The only issue is that with no head unit, you must have a third party, Bluetooth 4.0 compatible controller to make the whole thing work. At the moment that means an i-phone or i-pad. Ant+ and Android compatible controllers will probably follow once the KICKR is more widely available. Refreshingly Wahoo are keen to let other developers produce their own applications to control the KICKR. The Wahoo KICKR will be shipping on the 4th of March in the US and that first shipment has already been reserved. Unfortunately its only available in North America at the moment, though Wahoo do plan to extend their service to Europe and Asia in the future. The Wahoo KICKR is currently priced at $1099.